Biomedical signal processing and analysis is a point of impact for MTRI. Through collaboration with external medical domain expertise, our background in sensors, algorithms, and signal processing has been used to develop innovative approaches to the study, diagnosis, and treatment of disease. As an example, MTRI has an ongoing collaboration with neurologists at the University of Michigan Health System’s Michael S. Aldrich Sleep Disorders Center (UMSDL) targeted at significantly advancing the basic understanding of the sleep disorders and the state-of-the-art in automated sleep assessment and sleep disorder diagnosis. The collaboration is currently in the second year of a five year, National Institute of Health (NIH) funded project to improve the diagnosis and to understand the associated outcomes of childhood sleep disorders. Initial results from this joint work have been published in four journal papers and three conference papers over the last two years. During 2005 this study tested the hypothesis that respiratory cycle-related electroencephalographic changes(RCREC) predict sleepiness in patients afflicted with sleep disorder breathing. As summarized in (Chervin et al. 2005a), common polysomnographic measures of sleep-disordered breathing have shown disappointing ability to predict important consequences such as excessive daytime sleepiness. Using a novel analytic technique developed as part of the UMSDL and MTRI collaboration, it was observed that electroencephalographic activity shows detectable changes during non-apneic respiratory cycles in adults evaluated for sleep-disordered breathing. Quantification of these changes, which may reflect numerous inspiratory microarousals, could prove useful in prediction of excessive daytime sleepiness. The existence and extent of RCREC in various sleep stages and at various leads was also observed (Burns et al., 2005a; Burns et al., 2005b) A patent application for the RCREC metric and its clinical application was filed jointly with UM and is under review. Method for detection of respiratory cycle-related EEG changes in sleep-disordered breathing. Chervin RD, Burns JW, Subotic NS, Roussi C, Thelen B, Ruzicka DL., SLEEP, (2004a); 27:110-115. Correlates of respiratory cycle-related EEG changes in children with sleep-disordered breathing, Chervin RD, Burns JW, Subotic NS, Roussi C, Thelen B, Ruzicka DL., SLEEP, (2004b); 27:116-121. Respiratory cycle-related EEG changes (RCREC) predict neurobehavioral outcomes in childhood OSA. Chervin RD, Burns JW, Subotic NS et al., (2004c); SLEEP, 27 (Abstract Suppl.):A99. 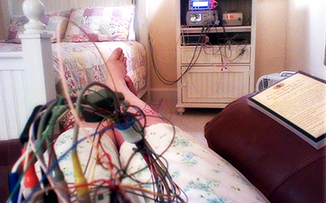 Electroencephalographic changes during respiratory cycles predict sleepiness in sleep apnea. Chervin RD, Burns JW, Ruzicka DL. (2005a) Am J Resp Crit Care Med; 171:652-658. Respiratory cycle-related EEG changes (RCREC) during specific sleep stages. Burns JW, Ruzicka DL, Chervin RD. (2005a) ,SLEEP ; 28: (Abstract Suppl.) A186. Respiratory cycle-related EEG changes (RCREC) at multiple EEG leads, Burns JW, Ruzicka DL, Chervin RD. (2005b) SLEEP ; (Abstract Suppl.)28:A187. Subjective sleepiness and polysomnographic correlates in children scheduled for adenotonsillectomy vs. other surgical care. Chervin RD, Weatherly RA, Ruzicka DL, Burns JW, et al. (2005c) Sleep; (in press). relationships between sleep quality and cardiovascular outcomes. All of these initiatives have the potential to improve the effectiveness and efficiency of health care diagnosis and treatment.